Original pencilled and inked cover art by Ed McGuinness and Dexter Vines. 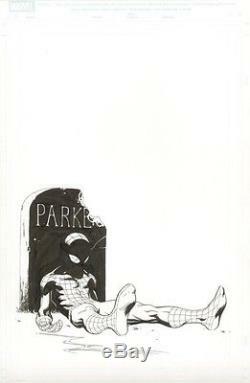 Published as the variant cover for Ultimate Comics Spider-Man #157. The item "Ed McGuinness Ultimate Spider-Man original comic book Variant cover art Death of" is in sale since Tuesday, July 18, 2017. This item is in the category "Collectibles\Comics\Original Comic Art\Covers". The seller is "howardtheduck78" and is located in Jacksonville, Arkansas. This item can be shipped to United States.